Tutor Mentor Institute, LLC: Urban Farming. Tutor/Mentor Strategy? Today's Chicago Tribune included an editorial showing Urban Farming as a strategy that could invigorate Chicago neighborhoods, and focused on the Urban Agriculture programs of the Chicago Botanic Gardens. I think this is one a strategy that could be embraced by youth serving organizations throughout the city, including public schools. The graphic below is from a pdf I title "Virtual Corporate Office" , which you can see below. 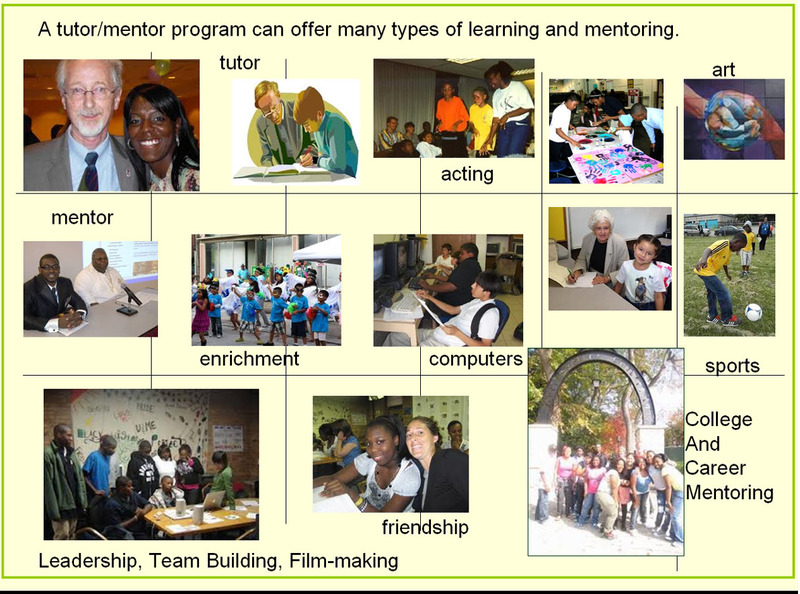 In it I show a mentor-rich non-school program to be a form of retail store for learning, mentoring and opportunity. Like a Macy's or Target store, mentor-rich programs have the potential to offer a wide range of age-appropriate learning opportunities, made available by volunteers from different industries. I'd love to see a connection made between urban agriculture leaders, leaders of youth serving organizations and donors, so that a map of Chicago could see a growing number of places where youth are learning skills and career opportunities as part of urban agriculture programs. With all of the vacant land in Chicago and other cities this seems to be a realistic opportunity. However, mentor-rich programs could also be mentoring technology, communications, arts, writing and many other skills, which apply to careers in urban farming and agriculture, and every other industry. What's needed to make this happen? I think that a program that educates people to be leaders of mentor-rich programs is needed. Take a look at the presentation below, which shows leadership of tutor/mentor programs to be a "jobs growth" strategy that cities could embrace. This goes out to alums of the Quaker/Montgomery Ward Chicago tutoring program at Cabrini-Green. Daniel F. Bassill, who was our fearless leader, puts out the following plea for leaders in Chicago and beyond to step up and help him continue this good work that truly makes a difference in people's lives. From Dan: "I would love to find a few leaders who think like this and who would adopt the Tutor/Mentor Connection as their mission. http://tutormentor.blogspot.com/.../the-pope-poverty... I also lead from behind and depend on others with greater talents and stronger networks to carry these ideas to reality. I had a structure helping me do this until 2011 but have not been able to rebuild it since then. There are several thousand alumni from the tutoring programs originating out of Montgomery Ward who could be such a team of leaders. I keep looking for one or two with the sense of purpose, and organizing skills, to take a role." I hope others will do the same. If you're a leader interested in responding, email me at tutormentor2 at earthlink dot net, or connect with me on Twitter, LinkdedIN or Facebook.